Diabetes educators routinely talk to patients with diabetes about daily foot care, but what role do nutrition professionals play in preventing and treating wounds in these individuals? According to the American Diabetes Association (ADA), the disease affects nearly 8% of the U.S. population, and its prevalence increased 13.5% from 2005 to 2007. Optimum diabetes management has been shown to minimize the risk of complications such as retinopathy, nephropathy, neuropathy, ischemic heart disease, cerebrovascular disease, and peripheral arterial disease. About 60% to 70% of people with diabetes have some type of nervous system damage that can include impaired sensation in the extremities. More than 60% of all nontraumatic lower limb amputations are performed on people with diabetes, a rate 10 times higher than for people without diabetes, according to the ADA. The circulation and nerve damage that often occur in diabetes combine to make wound healing more problematic, leading many physicians to categorize diabetic foot wounds as the most common chronic wounds in the world. Even more frightening for people with diabetes, one half of amputees die within 18 months, and 80% won’t survive five years, according to a 2008 Diabetes Forecast article. According to Nancy Collins, PhD, RD, LD/N, FAPWCA, founder and executive director of RD411.com and a recognized authority on nutrition and wound care, there are no evidence-based nutrition therapy guidelines for diabetic wound care. But we can extrapolate appropriate therapy using research and guidelines for other types of wounds, especially pressure ulcers. Hyperglycemia also leads to osmotic diuresis and the loss of water and electrolytes, which negatively impact wound healing by decreasing tissue oxygenation.3 Both extracellular and intracelluar dehydration occurs, impairing the ability of the skin to heal.4 Hyperglycemia also impairs the action of white blood cells, macrophages, and immune function, leading to an increased risk of infection and decrease in wound healing ability. Defects of fibroblast function, angiogenesis, and collagen production play a role in impaired wound healing found in people with diabetes.3 Hyperglycemia also increases the production of free radicals, which increases oxidative stress and leads to tissue damage and cell death.4 This cascade of effects of uncontrolled diabetes on wound care makes prevention crucial and requires optimum nutrition care to promote healing. There is no specific recommendation for an optimal blood glucose or hemoglobin A1c level to promote wound healing. According to the 2009 Standards of Medical Care in Diabetes, lowering A1c to below or around 7% has been shown to reduce microvascular and neuropathic complications of type 1 and type 2 diabetes. Without specific guidelines for blood glucose control to promote wound healing, it makes sense to set a goal for A1c below 7%. 1. Thirty to 35 kcal/kg body weight, adjusted based on changes in weight and wound healing1: According to Collins, calorie intake is the most important component of nutrition care for wound healing. Without optimum calorie intake, protein will not be available to promote wound healing, and vitamin and mineral intake will most likely be suboptimal. Collins explains that wound healing itself is an energy-intensive, anabolic process that demands optimal calorie intake. 4. Encourage a balanced diet that meets the RDA for all vitamins and minerals3: Becky Dorner, RD, LD, president of Becky Dorner & Associates, Inc and Nutrition Consulting Services, Inc and a coauthor of the NPUAP white paper, notes that there is no research to support higher doses of vitamins or minerals. Collins agrees but notes that we may never have evidence-based guidelines giving specific micronutrient recommendations to promote wound healing because of the difficulty and expense of this type of research. Supplements may be required to meet calorie and protein needs in some people and can include homemade high-protein/high-calorie shakes or specialized commercial formulas such as BOOST, Glucerna, or similar products. Arginine is an amino acid normally produced in adequate amounts in the body. However, stress or illness may require increased amounts of arginine from the diet. Collins suggests a 30-day trial period of arginine to promote wound healing but warns that adequate calorie and protein intake must be the first priority. Patients with marginal nutrition status and intake will benefit from a multivitamin and possibly from additional zinc and vitamin C.1 However, there are no established guidelines for micronutrient supplementation in diabetic wounds. Wounds411.com has a variety of nutrition education materials for both nutrition professionals and patients, including guidelines for skin and wound nutrition that outline optimal amounts of calories, protein, fluids, vitamins, and minerals for various wound stages. Five hundred milligrams vitamin C given twice daily and 220 mg zinc sulfate given three times each day for up to two weeks, along with optimal calorie and protein intake, are suggested, according to the Web site. Linda Ro, MS, RD/LD/LDN, works in home healthcare and routinely sees people with diabetes who have foot ulcers. She recommends a food-first program for protein, encouraging an increased intake of milk, cheese, and peanut butter in addition to the meat most of her patients consume. Since it’s difficult to obtain optimum amounts of zinc and vitamin C from foods, she also recommends (with physician approval) a multivitamin plus 25 mg zinc and 500 mg additional vitamin C as long as there is no history of kidney stones. For patients who can afford a supplement, she may use Resource Arginaid or, if Arginaid is not affordable, Ensure, BOOST, Slim-Fast, or Carnation Instant Breakfast. The bottom line for nutrition professionals who work with diabetic wounds is threefold: prevention with excellent blood glucose control and a healthy diet; prompt treatment with optimum amounts of calories, protein, fluids, and vitamins/minerals; and frequent reassessment to adjust the nutrition care plan to promote optimal wound healing. — Lynn Grieger, RD, CDE, cPT, is a health, food, and fitness coach in southwest Vermont and online at www.lynngrieger.com. 1. Dorner B, Posthauer ME, Thomas D. The role of nutrition in pressure ulcer prevention and treatment: National Pressure Ulcer Advisory Panel white paper. Available at: http://www.npuap.org/Nutrition%20White%20Paper%20Website%20Version.pdf. Accessed May 24, 2009. 2. Dorner B. New recommendations for treating pressure ulcers. Today’s Dietitian. 2009;11(5):14-16. 3. Khan MN. The influence of diabetes on wound healing. The Diabetic Foot. Autumn 2005. 4. Posthauer ME. 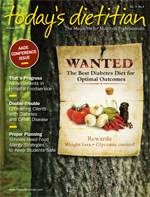 Diet, diabetes, and wound management: How important is glycemic control? Holist Nurs Pract. 2004;18(6):318-320. 5. Hill J, Landers P, Butcher J, Solnok H. Are wound care protocols evidence based? J Am Diet Assoc. 2008;108(9):A29.